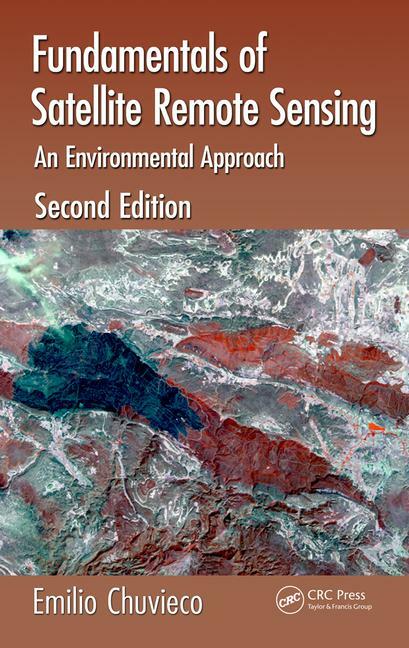 Fundamentals of Satellite Remote Sensing: An Environmental Approach. Second edition. CRC Press, Taylor & Francis Group, 2016. 486 p. $84.96. 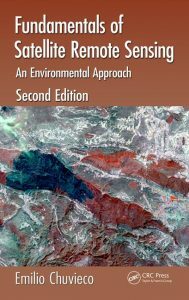 The book Fundamentals of Satellite Remote Sensing: An Environmental Approach is a fantastic resource for students as well as professionals who would like to understand the foundation of present-day remote sensing. The second edition is based on the 2010 first English edition book, translated by Professor Alfredo Heute, and it includes updates of several topics from the first edition. The 468-page book contains more than 200 high-resolution color images, which often combine more information than black-and-white images. These images help greatly to enhance the reader’s understanding of the subject matter. I appreciate very much the effort undertaken by the author and the publisher to acknowledge the copyrights of all the documents, text, and images used. Similarly, I am impressed with the index, as it contains all of the items that a reader might want to find. The reference section contains many excellent resources for learning more about specific topics. I found that the date of the cited papers was centered on the year 2000, but two or three cited resources are from after 2010. Slides and more updated resources are available at the publisher’s website for those who want to adopt the book for a course. For a reader who wants to have resources readily available, the book is available as an e-book, and it can be rented as an e-book. After a preface and a short biography of the author – a distinguished Professor of Geography and Director of the Environmental Ethics Chair at the University of Alcalá, Spain – the list of the book’s nine chapters are provided: Chapter 1 – Introduction; Chapter 2 – Physical Principles of Remote Sensing; Chapter 3 – Sensors and Remote Sensing Satellites; Chapter 4 – Basis for Analyzing EO Satellite Images; Chapter 5 – Visual Interpretation; Chapter 6 – Digital Image Processing (I): Enhancements and Corrections; Chapter 7 – Digital Image Processing (II): Generation of Derived Variables; Chapter 8 – Validation; and Chapter 9 – Remote Sensing and Geographic Information Systems. At the end of each chapter, there is a useful section titled “Review Questions.” The book ends with an appendix that provides the acronyms used in the textbook and the correct answers to the “Review Questions” published at the end of each chapter. I used these questions as a quiz to challenge myself, and I found the exercise very useful and stimulating. Chapters 1 and 2 review the international laws that manage the collection and use of satellite data and the physical basis of the sensors, whether optical, radar, or microwave, that are located on the satellite platforms. Readers can also delve into the basic physical principles of remote sensing. Chapter 3 covers some of the most common sensors used to collect data and metadata and includes a useful summary of the sensors associated with the different satellite platforms. The chapter mentions most of the countries that have satellite programs, including the United States, Russia, China, Japan, India, Brazil, Argentina, Taiwan, and South Korea. It also mentions several key private companies, such as Space Imaging, Orbimage (renamed Geo Eye), Earthwatch, and DigitalGlobe. I was disappointed, however, that the book did not discuss the more recent, innovative, satellite technology such as Planet satellites and Dove by Spaceflight. Chapter 4 “Basis for Analyzing EO Satellite Images” and Chapter 5 “Visual Interpretation” were helpful given their description of the practical methodologies related to collection, analysis, and visualization. I found particularly useful the discussion on the importance of a legend – on how often each classification in remote sensing is not interoperable and may mean different things to different people who apply different classification methods. I appreciated the last section of Chapter 4, with one case study in the Southwest United States and another in Brazil’s Amazonia. In Chapter 5, I liked the discussion of the CEOS data and metadata, as well as the hierarchical methodologies to visualize the data. Chapters 6 and 7 discuss exhaustively image processing and the basics governing it. The book discusses in detail and clearly the needs of geometric and radiometric correction, as well as the needs and best practices for georeferencing an image, and it specifies the situations to consider digital elevation models (DEM). The author is thorough with the descriptions of the different methods of classification, indicating the similarities and differences as well as the benefits and drawbacks of specific types of data categorization. He also provides some resources for people who want to go beyond the introductory level of this book. Similarly, the book discusses in detail the multitemporal analysis of data, specifying the drawback and benefits of some of the most commonly used methods for change detection such as multitemporal color composites, image differencing, principal component analysis, regression analysis, change vector analysis, and change threshold analysis. Towards the end, Chapter 7 discusses the metrics used to evaluate the texture or spatial variability of an image. Global metrics for continuous data, such as the use of the semivariogram, the spatial autocorrelation methods, and other methods, are described. In addition, local metrics for continuous data are covered, with the author mentioning that the simplest approach is to build first-order texture metrics of the standard deviation of the original pixel values within a certain window size, or alternatively to build a co-occurrence matrix, and specifying how to do so. The author also describes in detail how to build global and local metrics for classified data. In each case, the book provides useful examples to analyze and compare. Chapter 8 discusses the validation part of the analysis process and, in particular, the need to calculate the accuracy, precision, and stability or the consistency of accuracy throughout the time of the datasets. As part of this discussion, the authors talk about the different sources of errors in geospatial datasets. This chapter is extremely important for anyone who collects data, and the discussion of the sampling process to collect data is stimulating and useful. Chapter 8 is also very clear in explaining the confusion matrix, one of the most popular methods for validating classified images, although it also reports other methods such as kappa statistics to evaluate the accuracy of a raster dataset (image or grid). In addition, Chapter 8 briefly proposes different methods for verifying multi-temporal datasets. In Chapter 9, titled “Remote Sensing and Geographic Information Systems,” the authors focus on geospatial data integration and cover it in a brief way, although this chapter could be the topic of an entire book or a series of books. The chapter discusses the importance of generating input variables with appropriate metadata and with quality assurance and quality control. These types of input range from ground sampling to other forms of spatial and temporal sampling. In the chapter, the authors discuss how this information becomes critical when dealing with disasters. I realize that any book cannot cover all relevant topics due to space limitations, but I would have liked this book to include discussions on geospatial web services and open source applications, and to focus more on the integration of remote sensing and geographic information systems. Perhaps the third edition will include these topics. In summary, I think that this book is an extremely informative and useful resource for students, instructors, researchers, and professionals in the geospatial field and in ecology. Not only does the book discuss issues in a concise and clear way, but the graphics and imagery used are very informative and help to clarify potentially confusing concepts. The bibliography is particularly helpful as it allows the reader to easily delve into detail on a certain topic. I recommend this book highly as an addition to any library on remote sensing.